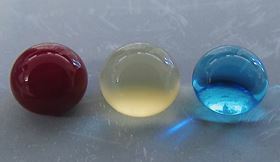 These are blood, plasma and water droplets beading on a superomniphobic surface made from fluorinated nanotubes on titanium. Image: Kota lab/Colorado State University. Medical implants like stents, catheters and tubing can cause a risk of blood clotting and infection – a perpetual problem for many patients. Engineers at Colorado State University (CSU) have now developed a potential solution: a specially-grown, ‘superhemophobic’ titanium surface that's extremely repellent to blood. The surface could be used to produce surgical implants with a lower risk of rejection by the body. This innovation occurs at the intersection of two disciplines: biomedical engineering and materials science. The work, reported in a paper in Advanced Healthcare Materials, is a collaboration between the labs of Arun Kota, assistant professor of mechanical engineering and biomedical engineering, and Ketul Popat, an associate professor in the same departments. Kota is an expert in novel, ‘superomniphobic’ materials that repel virtually any liquid, while Popat is an innovator in tissue engineering and bio-compatible materials. Starting with sheets of titanium, which is commonly used for medical devices, their labs produced chemically-altered surfaces that act as perfect barriers between the titanium and blood. In experiments, these surfaces showed very low levels of platelet adhesion, a biological process that leads to blood clotting and eventual rejection of a foreign material. A material that is ‘phobic’ (repellent) to blood might seem counterintuitive, say the researchers, as often biomedical scientists use materials that are ‘philic’ (with affinity) to blood to make them biologically compatible. "What we are doing is the exact opposite," Kota said. "We are taking a material that blood hates to come in contact with, in order to make it compatible with blood." The key innovation is that the surface is so repellent that blood is tricked into believing there's virtually no foreign material there at all. The undesirable interaction of blood with foreign materials is an ongoing problem in medical research, Popat said. Over time, stents can form clots and obstructions, leading to heart attacks or embolisms. Often patients need blood-thinning medications for the rest of their lives – and these drugs aren't foolproof. "The reason blood clots is because it finds cells in the blood to go to and attach," Popat said. "Normally, blood flows in vessels. If we can design materials where blood barely contacts the surface, there is virtually no chance of clotting, which is a coordinated set of events. Here, we're targeting the prevention of the first set of events." The researchers analyzed variations of titanium surfaces, including those with different textures and chemistries, comparing the extent of platelet adhesion and activation. They found that titanium surfaces with fluorinated nanotubes offered the best protection against clotting, and the researchers now plan to conduct follow-up experiments. Growing a surface and testing it in the lab is only the beginning, the researchers say. They want to continue examining other clotting factors, and eventually to test real medical devices. A new self-healing, water-repellent, spray-on coating is hundreds of times more durable than its counterparts.